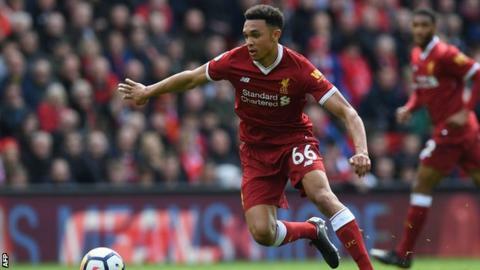 Uncapped 19-year-old Liverpool defender Trent Alexander-Arnold is in Gareth Southgate's 23-man England squad for this summer's World Cup in Russia. Analysis: Has Southgate found answers to key questions? Age: Based on players' age on the first matchday, England have named their third youngest squad for a World Cup (26 years 18 days) behind only the 1958 (25 years 81 days) and 2006 (25 years 286 days) editions. Continuity: Only five of the players featured in the 2014 squad - Cahill, Jones, Henderson, Sterling and Welbeck. This compares with six in the squad of four years ago that had been picked for the previous tournament. Alexander-Arnold's call-up is his first for the England senior team and follows the right-back's breakthrough season at Liverpool. "He said to me: 'OK, good. You're in the squad!' It was a really proud moment." Alexander-Arnold is one of four full-backs in the squad, alongside Manchester City's Kyle Walker and Tottenham pair Kieran Trippier and Danny Rose. Manchester City's Fabian Delph and Manchester United's Ashley Young have played in a full-back position for the majority of this season at their clubs. Hart, 31, has won 75 caps and was England's first-choice goalkeeper at the past three major tournaments but has had a poor season, conceding 39 goals in 19 Premier League games on loan at West Ham. Burnley's Pope was chosen over him, joining recent starters Jack Butland and Jordan Pickford in the squad, while Clarets team-mate Tom Heaton is selected as the goalkeeper on the standby list, despite not playing since September because of injury. Bertrand withdrew from the squad for the friendlies against the Netherlands and Italy in March with injury, but had featured in nine of England's previous 10 games. "Both calls were really tough," Southgate said. "They're both good guys and have contributed a lot throughout qualification, so it wasn't an enjoyable part of the job and I feel it's important to acknowledge their contribution in getting us to Russia. "With Joe, we've got three other goalkeepers who have had very good seasons and the decision I was faced with was do I keep Joe in and have experience around the group or give the three guys who have basically had a better season a chance? "Ryan is also very unfortunate in that it's probably one of the strongest positions we have. Ryan has had a decent season but I just felt the others were ahead of him." One player returning to the squad is Chelsea centre-back Cahill. He was left out of England's most recent squad for the friendlies against the Netherlands and Italy in March. Before that, the 32-year-old was an unused substitute in friendlies against Brazil and Germany, plus the final World Cup qualifier against Lithuania. Cahill was preferred to fellow centre-back Chris Smalling, who played 45 times for Manchester United this season. Wilshere and Newcastle's Jonjo Shelvey, who had been tipped for an inclusion after impressive form at the end of the season, have been overlooked in midfield. Arsenal forward Danny Welbeck, who scored five Premier League goals this season, is included. Jack Butland: Every call-up is an honour, but a World Cup call-up is something extra special! I've always dreamed of this moment and can't wait for the next couple of months. Kyle Walker: Honoured to be able to represent England at the 2018 World Cup! Can't wait to get there and do the fans proud! Thank you for all your kind messages! Dele Alli: It's an honour to be named in the England squad for the World Cup. It's a dream come true! Get me to Russia!! Marcus Rashford: After years of you standing on the touchline in the cold and rain, mum, we're off to the World Cup! Jamie Vardy: What an honour! No words to describe the feeling right now..... can't wait to get going! See you in Russia. Trent Alexander-Arnold: Dreamt of going to a World Cup since I was a kid. Today that dream come true, an honour to represent the Three Lions this summer! As ever with squad announcements, speculation was rife before the 23 names were released at 14:00 BST, with two Germany-based players in particular mentioned on social media. Jamaica-born Bayer Leverkusen winger Leon Bailey sparked rumours by tweeting a picture of himself with the caption "humble lion" shortly before the announcement. Reports suggest the 20-year-old, who has scored 12 goals in Germany this season, qualifies for England through his grandparents but there remain doubts about his eligibility. Speculation also suggested Borussia Dortmund winger Jadon Sancho was going to be named on the standby list by Southgate. Sancho only made his first-team debut in October and has played 12 times for Dortmund this season, having joined from Manchester City in August. He has started the German club's past four matches, scoring once and providing three assists, and was part of the England team that won the 2017 Under-17 World Cup. Has Southgate found answers to key questions? Read more on England World Cup squad: Has Southgate found answers to key questions?